Known For: Landau–Ramanujan constant, Ramanujan conjecture, Ramanujan prime, Ramanujan–Soldner constant, Ramanujan theta function, Ramanujan’s sum, Ramanujan’s master theorem and many more. Srinivasa Ramanujan was a great Indian mathematician who lived during the British Rule. Despite not having any formal training in mathematics, he made amazing contributions to mathematical analysis, number theory, infinite series, continued fractions and also gave solutions to mathematical problems which earlier were considered to have no solutions. Ramanujan was invited to Cambridge, England where he spent almost 5 years and produced groundbreaking new theories. He was the first Indian to be elected a Fellow of Trinity College, Cambridge. He became one of the youngest Fellows of the Royal Society (FRS) and only the second Indian member. Ramanujan independently compiled nearly 3,900 results most of which were identities and equations. Ramanujan was born on 22 December 1887 into a Tamil family in Erode, Madras Presidency, now Tamil Nadu, India. His father, K. Srinivasa Iyengar, was a clerk in a sari shop and his mother Komalatammal was a housewife who often sang at a local temple. They lived in the town of Kumbakonam, which has now been made into a museum. Ramanujan faced many hardships right after his birth. Many of his siblings were victims of infant mortality and didn’t even complete first year of their life. When he was two year old, Ramanujan contracted smallpox. His early schooling was affected due to a number of family tragedies as he moved to different places. He was influenced by his mother who taught him ancient Indian cultures, traditions and way of life. Ramanujan became a devout and religious Hindu. In 1897, when Ramanujan was ten years old, he passed his primary examinations at the Kangayan Primary school, in English, Tamil, Arithmetic and topped in the district. He then enrolled in the Town Higher Secondary School. By age 11, he had learnt college level mathematical knowledge and studied book by S. L. Loney on advanced trigonometry. By the age of 13, he was discovering sophisticated theorems on his own. By 14, he was receiving merit certificates and academic awards, which continued till later in his life. He was interested in geometry and infinite series. In 1902, Ramanujan developed his own method to solve the quartic equations and as trying to solve the quintic, not knowing that it could not be solved by radicals. In 1903, at the age of 16, Ramanujan got a copy of A Synopsis of Elementary Results in Pure and Applied Mathematics, by G. S. Carr, which he studied in detail. Next year, in 1904 he independently developed and investigated the Bernoulli numbers and calculated the Euler–Mascheroni constant up to 15 decimal places. In 1904, he graduated from Town Higher Secondary School, and received a scholarship to study at Government Arts College, Kumbakonam, but he was interested only in Mathematics. He later enrolled at Pachaiyappa’s College in Madras. There he passed in mathematics, but failed in other subjects. He left college without a Fellow of Arts degree and continued to pursue his research in mathematics. He lived in extreme poverty and on the brink of starvation. In 1909, Ramanujan married Janakiammal. After the marriage, Ramanujan developed a hydrocele testis but his family did not have the money for the operation, till in January 1910, a doctor volunteered to do a free surgery. In 1910, when he was 23, he had a chance meeting with V. Ramaswamy Aiyer, the founder of the Indian Mathematical Society. This led to his enrolment as a researcher at the University of Madras. Later, to earn a living he tutored students who were preparing for their F.A. exam. In 1913, upon getting a research position at Madras University, Ramanujan moved with his family to Triplicane. While looking for a job at the revenue department, Ramanujan met deputy collector V. Ramaswamy Aiyer, founder of the Indian Mathematical Society, who was impressed by his mathematical work, and forwarded his case to R. Ramachandra Rao, the district collector for Nellore and the secretary of the Indian Mathematical Society. Rao was equally impressed by his work but conducted due diligence to ascertain that it was indeed his original work. Rao sent him to Madras with financial aid, to continue his research. Ramanujan later had his work published in the Journal of the Indian Mathematical Society. He later wrote another paper and also continued to provide problems in the Journal. In 1912, he got a temporary job in the Madras Accountant General’s office, which lasted just a few weeks. Then he applied for a position under the Chief Accountant of the Madras Port Trust, and was appointed as an accounting clerk. There, Ramanujan continued his mathematical research after completing his official assignments. In 1913, Ramanujan’s work was sent to British mathematicians M.J.M. Hill of University College London. He also sent letters to leading mathematicians at Cambridge University, H. F. Baker and E. W. Hobson and to G. H. Hardy. Hardy was impressed by Ramanujan’s work relating to infinite series. Hardy asked his colleague, J. E. Littlewood to take a look at the papers. Littlewood was amazed by Ramanujan’s genius. In February 1913, Hardy wrote Ramanujan a letter expressing his interest in his work, and asked him to come over to England. However, Ramanujan refused to leave his country according to the Brahmanical traditions. The Board of Studies in Mathematics agreed to grant Ramanujan a research scholarship for the next two years at the University of Madras. Ramanujan continued to submit papers to the Journal of the Indian Mathematical Society. On 17 March 1914, Ramanujan at the insistence of his mother, voyaged to England by ship S.S. Nevasa, leaving his wife behind in India. He began his work with Littlewood and Hardy. Ramanujan spent nearly five years in Cambridge collaborating with Hardy and Littlewood. He published his findings in the journals. In 1916, Ramanujan was awarded a Bachelor of Science degree by research, which was later renamed PhD. His work on highly composite numbers was published in the Proceedings of the London Mathematical Society. On 6 December 1917, he was elected to the London Mathematical Society. In 1918, he was elected a Fellow of the Royal Society. He was the second Indian after Ardaseer Cursetjee in 1841 to become a Fellow of FRS, and at 31 years, the youngest Fellows. This was for his investigation in Elliptic functions and the Theory of Numbers. On 13 October 1918, he became the first Indian to be elected a Fellow of Trinity College, Cambridge. Ramanujan’s health worsened in England during 1914–1918. He was diagnosed with tuberculosis and confined to a sanatorium. In 1919, he returned to India and stayed at Kumbakonam, Madras Presidency. He passed away in 1920, at the age of 32. After his death, his brother Tirunarayanan chronicled and compiled Ramanujan’s remaining handwritten notes consisting of formulae on singular moduli, hypergeometric series and continued fractions. His lost notebook was rediscovered in 1976 and caused great excitement among mathematicians. Ramanujan was a dignified man with pleasant manners, somewhat shy and of quiet disposition. He lived a rather Spartan life at Cambridge. He was a rigorously orthodox Hindu. He credited his acumen to his family goddess, Mahalakshmi of Namakkal. According to him, he would receive visions of scrolls of complex mathematical content unfolding before his eyes. According to Hardy, for Ramanujan all religions seemed equally true; and he was a strict vegetarian. 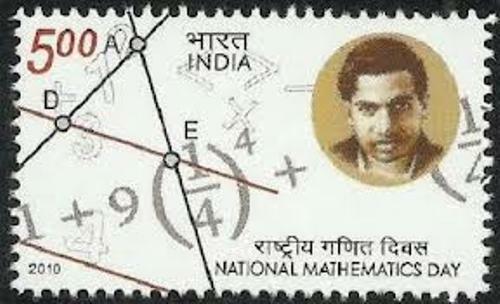 Government of India in 1962, the 75th anniversary of Ramanujan’s birth, released a stamp commemorating his achievements in the field of number theory; a new design of which was issued in 2011. In 2011, on his 125th birth anniversary, the Indian Government declared 22 December every year as National Mathematics Day, and 2012 would be celebrated as the National Mathematics Year. A number of honours have been instituted by many educational institutions in his memory.